The landscape of the uptown district of Charlotte, North Carolina, is dominated by mega-sports domes like the Bank of America Stadium, home to the Carolina Panthers, and the much-ballyhooed Nascar Hall of Fame, a 150,000-square-foot entertainment complex set to open May 11. But nestled amid these modern-day shrines to sweat and gasoline is a brand-new cultural oasis where high art reigns. Indeed, a 10-minute walk from the stadium to the hall of fame reveals three new museums and one new theater — which, by this fall, will have opened within one year and one block of one another on South Tryon Street. Called the Wells Fargo Cultural Campus, the project, which began in 2005, was the brainchild of Bob Bertges, the director of corporate real estate for Wachovia Corporation. “At the time, Wachovia was growing very rapidly. We were looking for a global approach,” Mr. Bertges said of both public and private efforts to lure international sophisticates to North Carolina’s biggest city. And despite the recent upheavals in the financial world — including Wachovia’s acquisition by Wells Fargo in 2008 — the plan for the campus has come to fruition. Perhaps the most eye-catching structure, and the most recent to open, is the Bechtler Museum of Modern Art (420 South Tryon Street; 704-353-9200; bechtler.org). Designed by the Swiss architect Mario Botta, the terra-cotta-tiled building has a playful, sweet-potato-like column supporting a cantilevered gallery containing works by marquee artists like Giacometti, Miró, Degas and Max Ernst. Louise Hanford, who has homes in both Charlotte and Florida, is a fan. “I was totally impressed,” she said. “It was built in consideration of the art it would accommodate.” As an example, she cited the expansive fourth-floor gallery that includes floor-to-ceiling windows surrounding an atrium in the middle of the space that give framelike views of works from one side of the floor to the other. The museum has an intimate feel because its entire collection — only 10 percent of which is shown publicly at one time — was amassed by one family. “Our holdings are a reflection of a particular family over 70 years and two generations who formed it while living in Zurich and the U.S.,” said John Boyer, president and chief executive of the museum. The Bechtler shares an event space with the Knight Theater (No. 430; 704-372-1000; blumenthalcenter.org), which opened last fall and is now the permanent home of the North Carolina Dance Theater. Across the street is the Mint Museum Uptown (No. 500; 704-337-2000; mintmuseum.org), a new annex for Charlotte’s highly revered institution. The 145,000-square-foot structure, scheduled to open in October, will house the Mint’s American and contemporary collections (Childe Hassam, Robert Henri, Ansel Adams), as well as some of its European holdings and all of its craft and design pieces. Down the block is the Harvey B. Gantt Center for African-American Arts and Culture (No. 551; 704-547-3700; ganttcenter.org). The center provides a permanent home for the renowned Hewitt Collection, which includes works by black artists like Romare Bearden and Ernest Crichlow. It also has three galleries with rotating exhibitions. 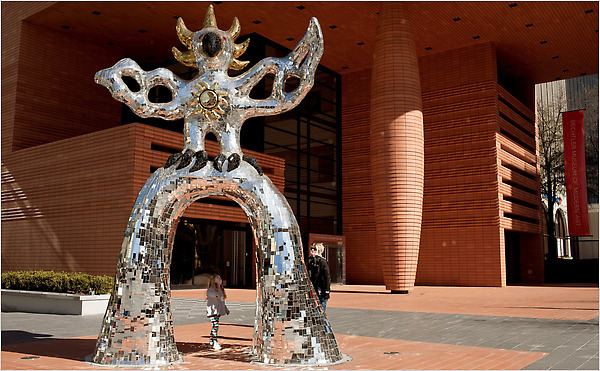 Image: Niki de Saint Phalle’s “Firebird” at the Bechtler Museum of Modern Art in Charlotte, North Carolina, part of the city’s new Wells Fargo Cultural Campus. HOUSTON, TEXAS  Pyrotechnics, exploding pigment, blowtorches, lacerated décollage, and found materials: these radical media, tools, and gestures characterize Nouveau Réalisme (New Realism), the avant-garde movement founded in Paris in 1960 by Pierre Restany and Yves Klein. 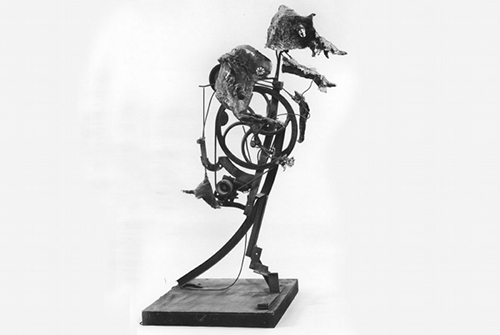 Together, the noted art critic and artist drew their inspiration from the contrarian, anti-art philosophies of Dada. Two shows shed light on the story behind the iconic photograph. 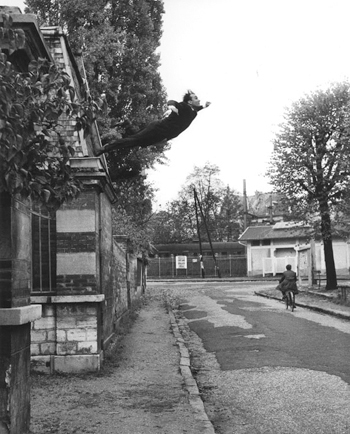 One of the best-known photographs in avant-garde art is Yves Klein’s Leap into the Void (1960), an image of the artist soaring over an empty street with an expression of pure bliss on his face. Down below, a bicyclist rides into the distance, unaware of the miraculous occurrence overhead, while at the end of the street a train passes by. Since Klein’s unexpected death, in 1962 at the age of 34, a mystery has remained: how did he make the purported leap? Two major exhibitions about to open should shed light on the controversies that still surround this iconic photograph, which was made six months before Yuri Gagarin’s flight into space and which Klein claimed (in fabricated broadsheets he inserted into France-Soir) was made partly to protest the space race: “Leaps into the Void: Documents of Nouveau Réalist Performance,” at the Menil Collection in Houston, and “Yves Klein: With the Void, Full Powers,” co-organized by the Hirshhorn Museum and Sculpture Garden in Washington, D.C., and the Walker Art Center in Minneapolis. Michelle White, assistant curator at the Menil, says she conceived “Leaps into the Void” after she discovered an odd object in the Menil archives: a piece of slate. It wasn’t art  just a piece of slate “collected” by Dominique de Menil in 1981 from the mansard roof that Klein presumably leaped from. The photograph, shot and assembled by Harry Shunk and Janos Kender, was originally published on November 27, 1960, in Klein’s broadsheet, which he considered a guerrilla intervention. In that faked four-page insert, titled Dimanche, Klein appropriates  as his artwork  all human activity on the planet for the entire day. The caption reads: “The painter of space hurls himself into the void!” When the piece of slate turned up nearly 50 years later, it was like a religious relic  proof of an apocryphal action that has reverberated ever since. Klein  part shaman, part showman  aimed not only to make art immaterial and demonstrate the presence of absence, but also to levitate into another dimension. Art critic and Klein friend Pierre Restany, in his 1982 monograph on the artist, only mentioned the photograph once, referring to it as “The Leap into Space, which was the prelude to this gesture (the appropriation of a day in the world), and over which hovers the greatest mystery (did the monochrome painter really jump? ).” It is curious that Restany, some two decades after the image was made  and after several different versions had been published  left its veracity open to question. Klein’s first love wasn’t art; it was judo, which he studied from 1946 to 1951, along with his buddies Arman and Claude Pascal. He earned a black belt and worked in Madrid as a judo instructor. At the same time, he explored various spiritual outlets, including Zen Buddhism and the cult of Saint Rita (patron saint of the impossible), and he studied Rosicrucianism with an old astrologer, Louis Cadeaux. In 1952, when he was 24, he went to Tokyo, where he attained the 4th Dan (Yodan) at the famed Kodokan Judo Institute. After returning to Paris, in 1954, he published The Foundations of Judo, which remains a classic, and he opened the Judo Academy of Paris, which was not a success. New research has turned up several clues to the circumstances surrounding Leap, but they are contradictory or ambiguous. It seems that in 1960, Klein did actually make a number of leaps. According to Menil archivist Geraldine Aramanda and documents in the Yves Klein Archives in Paris, he performed a rehearsal jump on January 12 from 67, rue de l’Assomption, the site of Colette Allendy’s gallery, where he had shown monochromes in 1956. Shunk and Kender’s famous photo was staged the following October 19, when Klein leaped from the roof ledge of a pavilion at 3, rue Gentil-Bernard, in the Paris suburb of Fontenay-aux-Roses. Two versions of that doctored photo were published during the artist’s lifetime: One in the fake Dimanche and the other, with no bicycle or train visible, in the catalogue for his 1961 show in Krefeld, Germany. There also exists a photo focusing closely on the leaper and the sky behind him, as well as one showing Klein, facing left, flying over the pillars of a gate; these are in the Menil archive and will be in the exhibition. According to Kerry Brougher, deputy director and chief curator of the Hirshhorn, Klein’s widow, Rotraut, confirmed to him that Klein made the leap several times. Some people maintain that his judo-school colleagues held a tarp to catch him, while others state that it was a blue sheet or a net. Brougher also says that Rotraut told him Klein claimed to have made an undocumented leap with one witness, no photographer, and no safeguards. While the leap itself has been confirmed, the accounts continue to differ: How was the artist caught? How did the instructors of the judo school, which was at 104, boulevard de Clichy and which supposedly closed in 1956, catch him? Adding to the intrigue, Shunk and Kender later split up, and it is thought that Shunk further rewrote history by omitting Kender’s name from the photo’s attribution. Perhaps the discrepancies can be explained by the unreliability of eyewitnesses, even those who are trained in art. The suspension of disbelief may merely be our own skepticism. Or perhaps the truth has yet to be revealed. In 2008 the Roy Lichtenstein Foundation acquired the entire photo archive of Shunk, who not only was the photographer for the artists in Paris but also later moved to Greenwich Village and became the photographer for Warhol and the Pop artists in New York. The Lichtenstein Foundation managed to prevent the photo archive from being dispersed. And the true story of Leap may still await us among those 100,000 negatives, contact sheets, and photographs. “Leaps into the Void: Documents of Nouveau Réalist Performance” will be at the Menil Collection in Houston from March 19 through August 8. “Yves Klein: With the Void, Full Powers” will be at the Hirshhorn Museum and Sculpture Garden in Washington, D.C., from May 20 through September 12 and then the Walker Art Center in Minneapolis from October 23 through February 13.